For the longest time Instagram has mainly been used as a platform to share pictures of your last summer vacation with your beloved ones, but recently the ever-changing face of Instagram has taken a drastic turn towards business. Nowadays, it is gradually more often used as a networking and marketing device. This is one of the reasons, why it is increasingly important to achieve a higher rate of engagement on your Instagram account: More traffic on your page means a growth in popularity, which, in turn, will help you to promote your business. In this article, you’ll find out how easy it can be to increase the engagement and therefore, build a successful Instagram page for your business! Can you remember the last time you decided to follow an account that hadn’t uploaded a post, let alone shown any activity in ages? If you are like me, then you will probably answer this question with a sharp “No”. This is why you should be very consistent when it comes to sharing content: Your followers follow you for a reason – they are interested in your matters and want to see regular postings. What they don’t want is to stare into an abyss of an empty Instagram feed all day. But what is the perfect activity rate? Usually, 1-2 posts a day are considered to be the sweet spot. So, a whole week of posting should come out to about 7-12 posts. By posting regularly, you will not only increase your follower count, but also the number of likes and attention you get. You have decided to stick to the “One post per day”-rule for the beginning and are already on the brink of sending out your first post. But don’t act too quick as the time you are sharing your content can make a dramatic difference! The best time to post is surely the time when most of your followers are active and able to spend time really taking in the content you’re sharing. Generally speaking, many Instagram users are very active in the morning and in the evening hours. However, you can easily find out about the habits of your followers by using the analytics of your business account or other tools. Then simply adapt to those habits. Another thing to keep in mind is, that sharing certain posts at certain, dedicated times might influence the engagement positively. For instance, many viewers are most receptive to strong posts, such as job offers, in the morning, whereas reposts or flashbacks work best in the afternoon. If you think about sharing something personal or a reminder, the evening is your time to go! 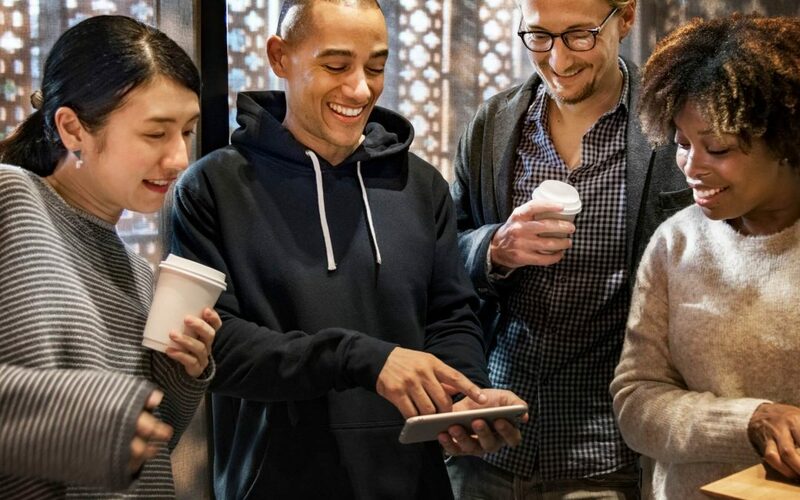 Remember that there are certain “Social Media rush hours” – times when a lot of people are sharing content and your post might be swallowed up by the crowd. Usually, this happens on sharp hours. You can avoid that by going around the rush hours and posting either a few minutes before or after a full hour. As Hashtags are one of the tools to bring you the majority of your engagement, they should not be handled negligently. First and foremost, it is essential to pick the right Hashtags: They should be relevant to your post and your business, descriptive and actively used as well as discussed by the community you’re aiming at. You could even go as far as creating your own brand Hashtag for people to use and increase your level of awareness even further! One thing to bear in mind is not to use shallow, overused Hashtags as they won’t help with organic growth. Much rather, think about what you are trying to get across and choose specific, descriptive Hashtags to go with that. Keep your caption clean by putting the Hashtags in the first post comment! This way the picture overview will look much neater and more organized, which contributes to a nice general look. There is much more to a single Instagram post than simply uploading a random picture and posting some Hashtags to go with it. Naturally, all you want to do after a long day of Content Planning and Creation is to lean back and relax. However, the period of time right after having posted a new picture on Instagram is hardly the perfect time to put your feet up. If you want to create a successful account, you have to put work into it and engage with your fans. On the one hand, this can be achieved by showing an interest in your follower base. If there are any questions emerging, go ahead and just give them a quick notice. If there is an agitated discussion going on in the commenting section, don’t hesitate to take part in it and share your opinion! Another way of increasing your engagement rate would be to be active on other peoples accounts. This can be easily done by liking and commenting on the latest pictures tagged with similar Hashtags to yours. Since engagement is a key component of Instagram’s algorithm, this will help your post to be shown to more people and might even make it end up on the “Explore” page! While back in its starting days Instagram was created as a picture-sharing platform. Nowadays, there are new features being added almost every other month. Videos, Stories, Story Highlights, Live videos, and IGTV are the most well-known features of today’s Instagram. Why not use them to your advantage? By using a broad combination of all the mentioned above, you will be sure to gain lots of new followers as videos, for instance, generate a lot more engagement than a single picture. 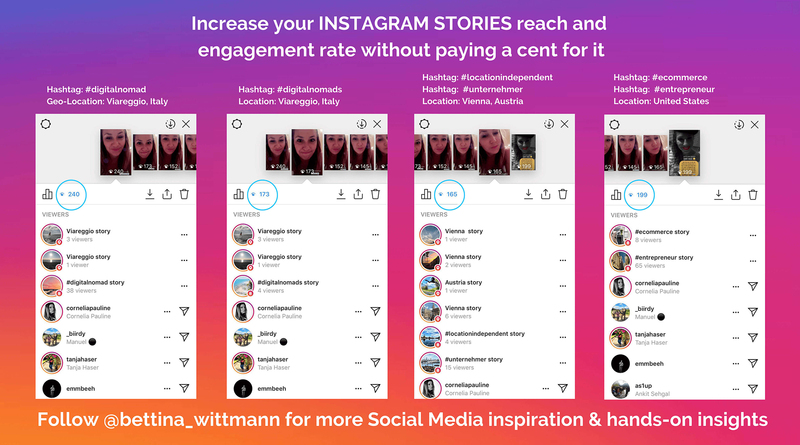 Another example for this would be that when doing a Live video on Instagram, your video will immediately be pushed to the front of the stories page, which undoubtedly will bring your account a lot of attention. Use relevant Geotags and Hashtags when posting stories! As it is easily visible in this case study, different combinations of Geotags and Hashtags generated different engagement rates. The conclusion that is to be drawn from this is that paying attention to tagging your stories is worth the effort in the end.